Webster City, Iowa – It had been at least four, maybe five years since my last visit to the Hamilton County Speedway. Probably because of my aversion for half-mile tracks would be the reason, but I couldn’t really say why. However long it’s been, I decided it was long enough, so I headed north…then west. The track has made its share of racing history over the last three-quarters of a century. On my drive up there, I mulled over all of the legendary names that have passed through their gates. Bob Shryock has to be at the top of the list, but you could mention Denny Hovinga, Greg Davis, Arlo Dorenbusch, Gene Schattschneider, and Bob Hill. They are just a few of the famous names that have wheeled a racecar on the big oval. Even the guys running the program earned a stellar reputation. The late Howard Mellinger would probably be at the top of that promoter’s list but guys like Don Cryder and Al Urhammer left their mark on the facility as well. Notable racing series such as the Busch All-Star Tour and the Deery Brothers Summer Series entertained race fans starting in the early 80’s and still do today. And who can forget the infamous American Outlaw Stock Car Organization that competed there in 1983? Now in its 74th year of operation, the track still entertains a weekly program on Saturday nights and it appears to be on solid ground with the Hamilton County Speedway Racing Association running the ship. Marla Williams, the speedway’s operation manager, does a fantastic job running the show every weekend and as I observed during my visit, she’s earned the confidence of drivers, fans and everyone involved there. She had a smile on her face the whole night and even a little kick in her giddy up at times. She gave me the impression that “she wanted to be there and was working for everyone’s best interest”. It was genuine…and let me tell you how important that is in today’s age. When any county fairboard decides they want to take charge of the racing program, yet hire someone to actually make the day in and day out calls on everything, it becomes vitally important to find someone such who doesn’t look at the position as a “go there, collect a paycheck, come back next weekend and repeat cycle”. That’s what happens more often than not. Sure, they have race experience, but after that, the rest of the boxes on the check list go unmarked. If at all possible, hiring someone from the community is always good and as they say, a little personality goes a long way. For the Hamilton County Fairboard, it appears they made a wise decision by putting the reigns in Marla’s hands. 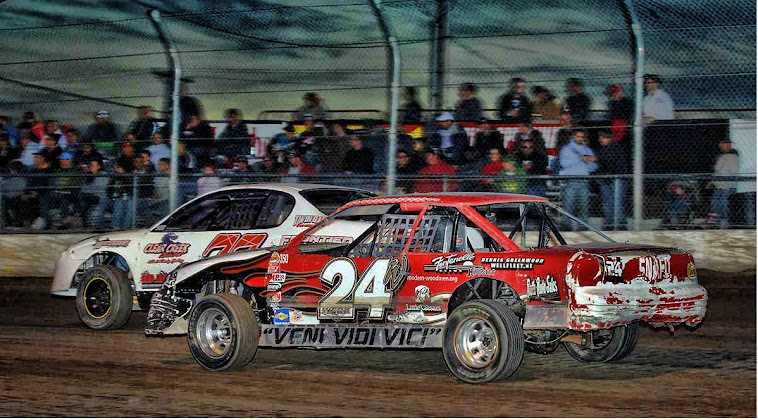 Six divisions of racing get down and dirty on the half-mile each and every Saturday night. Late Models, Modifieds, SportMods, Stock Cars, Hobby Stocks and Sport Compacts all race under the IMCA banner. The main characteristic of this track is it’s freaking huge, which in turn, produces incredible speeds, no matter what class of car is out there. “Give ‘em a little room and turn ‘em loose” is the motto they live by here at HCS. 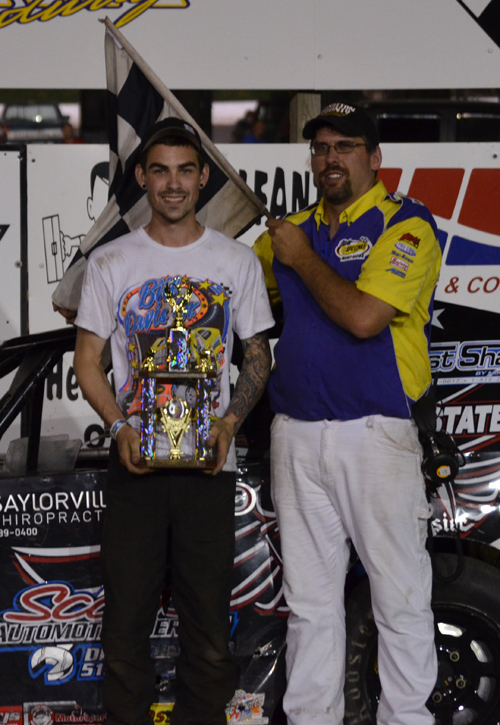 As quick as the high-powered Late Models and Modifieds are on this track, the SportMods, Stock Cars and Hobbies aren’t slouches by any means. While researching HCS a little before I made the trip over, I noticed they’re having the same issue as a lot of other tracks; a shortage of Late Models and Modifieds, but better than average on everything else. Sure enough, only eight Late Models checked in for the evening and maybe 10 or 11 Modifieds were roaming the pits. The upward costs of racing, the crappy economy and other factors are making it hard for a person to field a Late Model or Modified anymore, competitive or not. Not to mention, Keith Knaack’s vision for low cost racing has been thrown out the window and replaced with the almighty dollar and soul selling. Fortunately for myself, I don’t need horsepower to satisfy my thirst and the three “slower” divisions that sported double-digit figures more than made up for it with entertaining main events. 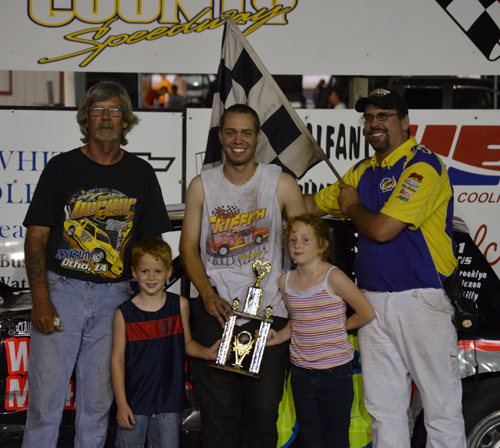 The Hobby Stock feature, although delayed by several cautions, saw Ty Griffith take the win over an impressive field. In fact, I would have to say that the Hobby Stocks that compete weekly at HCS are as competitive as a group as you’ll find anywhere. There were 12 to 15 drivers who defined the term “hard-charger” last night as they bumped and banged their way, not giving an inch to the guy or gal around them. It would turn out to be a Griffith family double-dipper on this evening as Ty’s brother Ryan would win the Late Model feature rather handily. You could probably say the same for the Stock Car entrees as well. This is another tough group of pilots that employ good hard racing, not giving much to the guy racing next to them, nor taking anything away. It’s bare-knuckle, hard-nose competition at its very best. A fantastic fireworks display at the conclusion of the program capped off a solid night of racing on Fan Appreciation Night at the track. On the way home, I reminded myself not to wait so long in between trips back. A special thanks to Marla Williams and the Hamilton County Speedway Racing Association for making my return to the historic half-mile a pleasant one.